Flowers aren’t just pretty to look at. They’re good for your health as well. 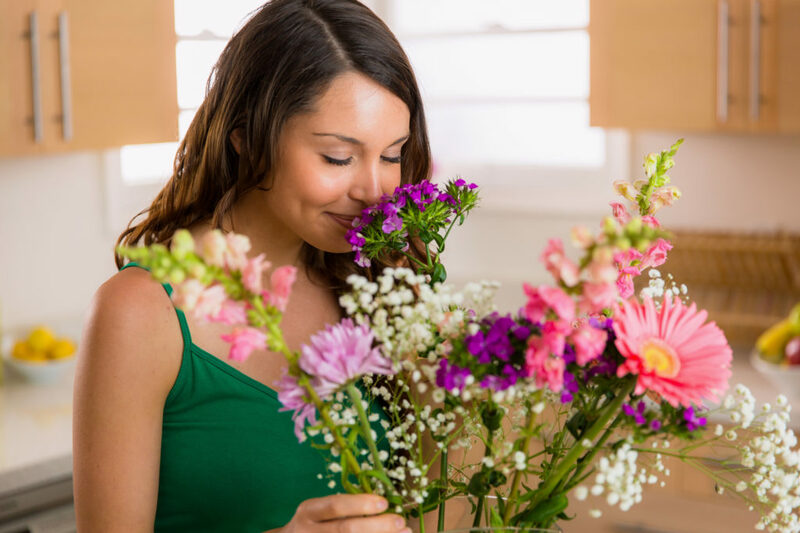 Read on to learn all about the health benefits of flowers. Flowers appeared on Earth around 130 million years ago. In that time they’ve evolved and diversified and–lucky for us–some of that diversity can have health benefits for humans. The benefits of flowers have been recorded for centuries, but what exactly are some of the positives to be had? Here are a few ways flowers benefit your health and wellbeing. The World Health Organization calls stress a “worldwide epidemic”. We’re all rushing somewhere – deadlines to meet, calls to make, families to provide for. It’s no wonder we’re all anxious. But did you know flowers can help with that? Flowers in a hospital patients room are proven to reduce anxiety and improve their recovery to boot. It’s thought that indoor plants help purify the air and moderate humidity, boosting the environment and your mood along with it. So if you have a loved one in the hospital, sending flowers might be the pick-me-up they need (learn more now). Missing deadlines? Not meeting your fitness goals? Flowers can help with that. The human notion of time is a tricky thing. As we get older, time literally starts to fly by. Flowers help us measure time by giving us something to focus on. You may not notice your deadline sneaking up on you, but you’ll notice your flowers blooming. The human brain loves to make and rely on associations. Bouquets of flowers are usually a positive association because they’re generally present at happy events. Another way flowers can affect your mood is through color association. Your favorite colors help you feel happy, calm, safe, or inspired. Keeping your favorite color flowers is a great way to invoke that sense of wellbeing. Just remember, if you’re displaying a bouquet get rid of it at the first sign of wilting. Dead flowers are definitely a mood killer. Quality sleep is an essential part of your daily routine. Not getting enough sleep impacts on patience, concentration, and mood. So where do flowers come into it? The smell of lavender is proven to lower your blood pressure and heart rate. It relaxes you, enabling you to more easily drift off to sleep. Gardenias have also been linked to lower anxiety levels and better quality sleep. Rosemary has been the subject of many scientific studies. One conducted in 2015 indicated that the smell of rosemary can actually improve your powers of recall. Specifically, it works on your future memory or what’s called “remembering to remember”. In real-world terms that might mean remembering to take medication or making sure we’ve bought our partner a birthday present. Rosemary contains a compound called 1,8-cineole, and it’s this chemical that scientists think affects our memory. Flowers don’t just make for a pretty decoration. They can also tangibly improve your health. Certain flowers can lift your mood, help you sleep, boost your productivity, and even improve your memory. With so many benefits of flowers to be had it’s high time you cluttered up your window sills. Looking to improve your health in more ways? Here are 4 proven health benefits of matcha tea.